The third day of qualifying round action in the FIBA U20 European Championship Women has become a type of "March Madness" with interesting results. Only two teams are eliminated from the title race as the Fiba U20 women enter the final day of qualifying. In Novi Sad it is over for Turkey in Group E while in Zrenjanin in Group F the Netherlands' hopes were shattered twice. The Netherlands had to rally from 22 points down against Latvia. They made up 20 points before fatigue set in and ended up losing to Latvia. However the Netherlands' elimination came about because Great Britain beat France. Great Britain, Italy and Latvia can all still qualify and the calculator is needed if the teams end on the same number of points in a three-way tie. Great Britain were defeated by the already eliminated Dutch team (66-70). Turnovers and fouls cost them dearly. As Italy won, with 29 points coming from Alessandra Tava, against Latvia (70-61), Great Britain and Italy have qualified for the quarter-final round. For the 1991 Italian and British generation this is the first time they have qualified for a quarter-final in Division A. Video interviews with Tava and Federica Tognalini are added as well as a video interview with Great Britain head coach Damian Jennings after the relevant match reports. In the last Fiba U20 Europe match of the day Spain won in all sectors of the game to beat France (68-33). You can read the full FIBA Europe match reports by selecting the link below. The first four minutes were rather scrappy with neither side able to impose any rhythm. Deanne Hayward scored 4 points for Great Britian while Kourtney Treffers with an AND-1 and Maxime Essenstam scored for the Netherlands to lead (5-4). The introduction of Chatilla van Grinsven for the Netherlands gave them some extra muscle inside. She made an immediate impact by getting to the foul line. However Great Britain were able to stay in control in front with the three-point shooting of Kristie Sheils (14-8) with three minutes to play. Great Britain, despite 5 points from Renee Busch allowed the Netherlands to close the gap with a 6-0 run (17-19). Van Grinsven tied the game with the first attack of the second quarter as she showed a good turn of pace to outdo the great Britain defense. Temitope Fagbenle picked up offensively with 5 points for Great Britain (24-21). But the pendulum was changing directions. The tall Dutch girls started to win the battle in the paint. With Van Grinsven causing mayhem and Maxime Essenstam picking up the rebounds they gave their side the advantage. 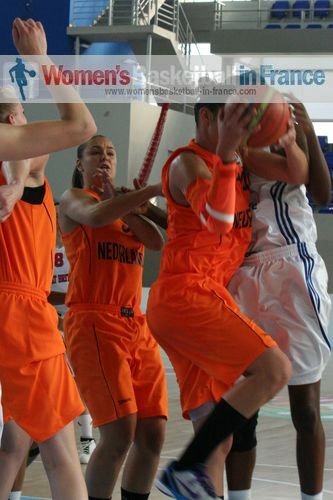 Tessel van Dongen nailed her team's first three-ball of the game for the Netherlands to go in front (31-28). The inside players did the rest as they went into the interval leading (35-32) with van Grinsven leading the way with 13 points and 7 rebounds. After a quick fire start by both teams at the start of the third quarter, the Netherlands went on a full court press and on a 8-2 run to open up the first double-digit lead of the game (48-38) with five minutes to play in the third quarter. Damian Jennings had no choice but to call a time-out. Nothing changed for Great Britain as the Netherlands, even without Van Grinsven maintained their double-digit advantage until 2 points from Ella Clark. A pair of free throws by Katrin Chiemeka were the last points of the quarter with the Netherlands going into the final quarter leading (53-47). The final quarter started at 100 km/h with end-to-end basketball. A trey by Chiemeka sparked Great Britain into action to reduce the deficit to 2 points off a curious incident after Treffers and Chiemeka collided. Both players ended on the floor while Rebecca Allison just picked up the ball to score (58-60). Essenstam kept the Netherlands in front as she managed to pick up second-chance rebounds with 90 seconds to play (67-63). The best way to describe the last 90 seconds was a comedy of errors by Great Britain as they failed to score and they gave the ball away. In order to try and stop the clock at the end Chiemeka was called for an unsportsmanlike foul for a jersey tug with five seconds to play. Two time-outs later, the Netherlands had won (70-66) with 50 points coming from Van Grinsven, Essenstam and Treffers with 19, 18 and 13 points each. Van Grinsven and Essentam also combined for 25 rebounds. Great Britain must now wait to see if they continue the FIBA Europe U20 European Championship adventure for the title. For the Netherlands there were only tears of disappointment for what could have been. Latvia needed to win by 6 points or more if they scored more than 54 points to qualify for the FIBA Europe U20 European Championship quarter-final. Sabine Niedola got her team off to a flying start with 7 points. But once Alessandra Tava got in her stride Italy rallied back. However an aerobatic reverse lay-up by Dita Rozenberga got Latvia going (9-7) midway through the first quarter. Tava then took over as Italy reclaimed the lead in a master class of clutch shooting as they edged the first quarter (18-16). The second quarter was not played with the same intensity as the opening quarter. Yet the Italians, with a half-court press, stretched their advantage into double digits (31-21) midway through the quarter. Latvia struggled to get anything going. However it was the Italian coach who called a time-out with nine seconds to play and Tava, the scorer became an assist agent as she floated a nice pass for Federica Nannucci to score on the buzzer for Italy to lead (39-28). The third quarter was an evenly contested affair without the fireworks. Italy maintained their lead going into the final quarter (56-43). Latvia went all out during the last quarter with some big shots coming from the land of many. But Tava (right) was on a one-lady demolition act with 12 last-quarter points as Italy went on to secure the victory (70-61). 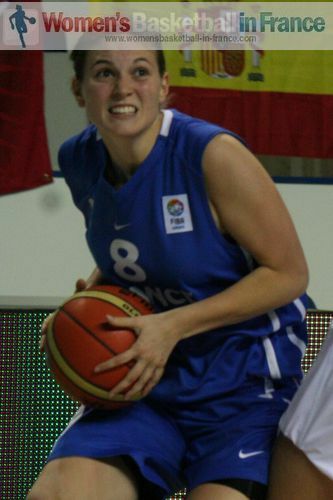 Italy had to finish the game without influential point guard Federica Nannucci (left) who rolled her ankle with three minutes to play. 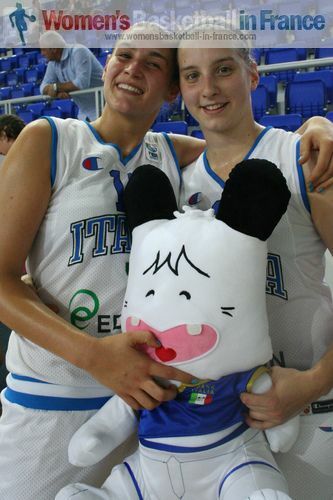 Alessandra Tava and Federica Tognalini are both members of the 1991 generation of Italian youth international players. Tava first played for Italy at U16 level in 2006 and was joined by Tognalini in 2007 when they lifted the U16 division B title. Both players represented Italy at both U18 and U20 championships with the 1990 generation and had to fight hard to avoid relegation. However with the 1991 generation that had beaten some of the Big nations in preparation games, they had just missed out on a quarter-final spot in 2009 on U18 level with an overtime loss. They had to be content with playing in the 9th-12th classification. For both players it was a big disappointment. That is why they are happy today that they are in the quarter-final of the FIBA Europe U20 European Championshipfor Women Division A because although they know they have the potential others do not have the same belief. Italy face Serbia, the hosts in a match that is shown live on Serbian TV. Spain's traditional tip-off play pass to Mariona Ortiz (left) worked again as Spain scored on the first attack. France took a while to score their first points as Linda Bousbaa set up a play by holding the ball forever before feeding it to Isabelle Strunc who rolled the ball to Kelly Corre to score. France were able to break the Spanish press with Sophie Le Marrec completing the play (4:2). Afterwards the Spanish coach called a time-out. A quick acceleration of pace and 5 points by Laura Gil and Amaya Gastaminza put Spain in control (11-4). Grégory Halin started to rotate his players. But apart from a driving jump shot from Strunc and a free throw, it was Spain who continued to dictate the pace. Leonor Rodriguez hit a baseline courner three-pointer while Vega Gimeno fired in a trade-mark long distance jumper. Finally Ondaye-Akoa Elenga managed to score for France. But Spain led (16-9) at the end of the first quarter. France went small to start the second quarter, hoping the pace of Touty Gandega and Princesse Goubo would trouble Spain. The plan worked well for about five minutes as France reduced the deficit (15-17). But that was as close as they got. Spain changed systems completely: first they alternated between inside and outside, then switched to a rolling transition instead of the standard full court press we have become used to. The result was that they outscored France 10-3 to go into the locker room with a double-digit lead (31-18) off a buzzer beating baseline jumper by Rodriguez. France kept Spain scoreless for almost three minutes. Then it went downhill all the way as they turned the ball over 7 times while allowing Spain to complete a 10-0 run started in the second quarter. No matter what France did Spain was better. France lost Manon Morel who slipped and fell. Basically it was like watching a roller coaster in action as Spain went into the final quarter leading (50-29). The game fizzled out as a contest with France just scoring once during the first minute and nothing else until the last seconds. France had also lost Strunc with 6:47 to play after she went for a lay-up and ended up colliding with the backboard post. Spain went on a 14-0 run to complete the second stage of the competition with a perfect record and go into the quarter-final of the 2011 FIBA Europe U20 European Championship undefeated with a (68-33) victory against France.